I practiced a bit of yoga before I was pregnant and stopped for a while because of work commitments. 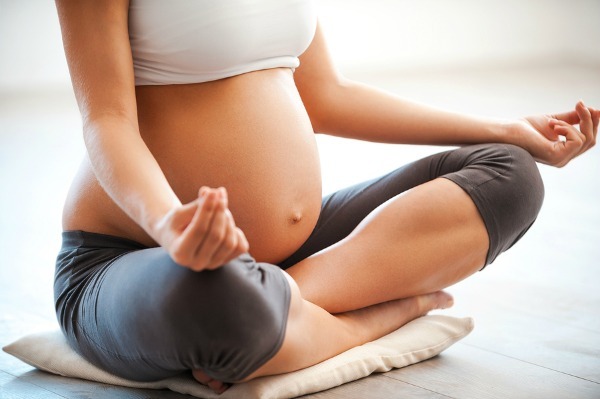 Being anxious about staying fit during pregnancy, I started attending pre-natal yoga classes. It is said that by practising pre-natal yoga, one can ensure a smooth pregnancy, natural childbirth and restoration of body shape after childbirth. 1) Sit with your buttocks on your heels. 2) Raise your buttocks and stand on your knees. 3) Lean forward and place your hands flat on the floor. 4) Inhale while raising your head and depressing the spine so that the back becomes concave. 5) Exhale, while lowering your head and stretching your spine upward. 6) At the end of the exhalation, contract your abdomen and pull in your buttocks. Your head will be now between your arms, facing the thighs. This is one round. I prefer attending yoga classes conducted by experienced trainers. First, there is someone to correct your poses as well as help you to achieve a pose. Next, there are other pregnancies around whom you can mingle and exchange pregnancy tips with. Last but not the least, because you have paid for the yoga package, you feel obliged to go to the class, thus “forcing” you to keep fit. I have tried Pure Yoga and Wasabi Yoga. Trust me when I tell you to save your money and time on Pure Yoga. Classes will be canceled if the centre decides that there are “not enough” attendees. Whereas at Wasabi Yoga, even though you have paid for a group class, the trainer will still conduct the session if there is only one student who has signed up for that session. Furthermore, the prices are reasonable and the trainers are very friendly and professional.